Finally confirming the rumors that have been circulating the internet for weeks, all four original members of the popular 90’s rock supergroup, Mr. Big, are taking to the stage together for the first time in 13 years for a reunion tour of Japan. The Japanese run will bring back the magic of the original chart-busting foursome: vocalist / frontman Eric Martin, Paul Gilbert, guitar, Billy Sheehan, bass, and Pat Torpey, drums. The tour takes off in Sapporo on June 5 and culminates June 20 in Tokyo with a feature concert at Budokan the famous Japanese venue known for its rich history of legendary performances by rock’s elite. The band will record a live CD / DVD during the Budokan show that will also mark the band’s 20 year anniversary! Formed in 1988, Mr. Big forged its place in hard rock history combining trademark “shredding” mucicianship with awesome vocal harmonies and signed a record deal in 1989 with Atlantic Records. The self-titled album. 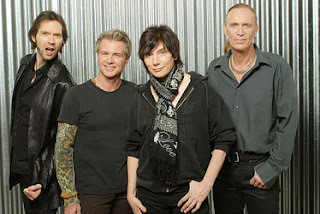 Mr. Big, received critical and commercial success in the US and Japan but it was the band’s second album, Lean Into It, that provided the major breakthrough. Lean Into It, featured two ballads that established the band as a commercial success, To Be With You and Just Take My Heart, propelling the band the band to huge international success and record sales in the multi-millions. Gilbert left the band in 1996 to pursue a solo career and the original members had not shared a stage together until late 2008 at Gilbert solo show at the House of Blues in Los Angeles. Paul was joined onstage by Sheehan and Torpey to perform a couple of covers songs and the three had such a good time together, they contacted Martin a few days later and the reunion was put into motion. While no concert dates beyond Japan have been announced as yet, the band is looking at possible dates in Southeast Asia and America later in the year. Joe Bosso (one of my guitar journalism heroes) from MusicRadar recently spoke with Billy Sheehan about the Mr. Big reunion. So I was just sitting around trying out my new iPhone, and I tested out the Google Reader. The very first heading I saw was Mr. Big Confirms 20th Anniversary Reunion, Plans To Tour Japan over at the Random Chatter Music blog. Feb. 1, 2009: It is the 20th anniversary of Mr. Big’s debut release (and also the 20th anniversary of Paul Gilbert’s first PGM signature guitar, the PGM 100). What better way to celebrate this then to re-form and then tour Japan, the beloved home-away-from-home of Mr. Big for many years? It will be exciting! The article continues with similar statements from the other members of Mr Big. I’m not sure how I feel about this. I love Mr. Big (there, I said it), but I really hope this will just be a one-off Japanese tour or something. I’d much rather hear Paul Gilbert and Billy Sheehan continue with their own music.